The NHL has had a presence in Las Vegas since 1991; that year, the city hosted the first outdoor game between two NHL teams – a preseason exhibition between the Los Angeles Kings and New York Rangers outside Caesars Palace. The Kings would subsequently organize "Frozen Fury" – a series of annual preseason games in Las Vegas against the Colorado Avalanche. The NHL Awards ceremonies have been held in Las Vegas since 2009. In 2009, the media speculated about a plan involving Hollywood producer Jerry Bruckheimer to move the Phoenix Coyotes to Nevada. Rumors of a Las Vegas expansion team surfaced again in August 2014, pointing to a new indoor arena on the Strip (built as a joint venture between Anschutz Entertainment Group, owners of the Los Angeles Kings, and MGM Resorts International) as the potential home arena, although these rumors were denied by the league. In November 2014, an unconfirmed report stated that the league had selected billionaire businessman Bill Foley and the Maloof family (former owners of the National Basketball Association's Sacramento Kings, and founders of the Palms Casino Resort) to lead the ownership group for a Las Vegas expansion team. In December 2014, the NHL's board of governors decided to allow Foley to hold a season ticket drive to gauge interest in a Las Vegas team, though league commissioner Gary Bettman also warned the media to "[not] make more out of this than it is". The season ticket drive began in February 2015, with interested parties placing ten percent deposits for the 2016–17 season. The drive drew 5,000 deposits in its first day and a half, and reached its goal of 10,000 deposits by April 2015. In June 2015, the league officially opened the window for prospective owners to bid on expansion teams. By this point, Foley had secured more than 13,200 season-ticket deposits. Two expansion applications were submitted: Foley's application for a Las Vegas team, and a bid from Quebecor to revive the Quebec Nordiques at a new arena in Quebec City. Both Las Vegas and Quebec were invited to move into Phase II of the league expansion bid in August 2015, and subsequently advanced to Phase III. At the league owners' meeting on June 22, 2016, in Las Vegas, the Las Vegas expansion bid was approved by a unanimous vote, with play to begin in the 2017–18 NHL season. The team became the first major professional sports franchise to be based in Las Vegas, and the first NHL expansion team since 2000. Foley committed to pay the league's $500 million expansion fee and began the process of hiring the team's principal staff and determining its official identity. Foley announced that former Washington Capitals general manager George McPhee would be the franchise's first general manager. On November 22, 2016, the name was revealed as the Vegas Golden Knights. On March 1, 2017 (coinciding with the league's trade deadline), the team completed its expansion fee payments and filings, making it eligible to formally begin operations such as free agent acquisition, and participation in league meetings. Five days later, the Golden Knights made their first personnel move by signing Reid Duke to a three-year entry-level contract. Gerard Gallant coaching the Golden Knights during their inaugural 2017–18 season. Gallant was named as the head coach in April 2017. The team announced inaugural head coach Gerard Gallant on April 13, 2017. Over the next two months, the Golden Knights developed their farm system, announcing affiliations with the Chicago Wolves of the American Hockey League and the Quad City Mallards of the ECHL. The team participated in the 2017 NHL Expansion Draft on June 21, 2017, selecting an available player from all 30 teams in the NHL. The draft picks were announced at T-Mobile Arena during the NHL Awards ceremony. Some notable selections included goalie Marc-Andre Fleury from the Pittsburgh Penguins and winger James Neal from the Nashville Predators. At the 2017 NHL Entry Draft, Cody Glass was the first player selected by the Golden Knights. The Golden Knights played their first game on October 6 against the Dallas Stars with Neal scoring the franchise's first two goals en route to their first victory. The team's inaugural home game was played on October 10, 2017, hosting the Arizona Coyotes as the second game of a home-and-home series. In the aftermath of the October 1 mass shooting, the pre-game ceremonies honored the victims of the attack, and the team issued an appeal for donations to its charitable arm. With their 5–2 win, the Golden Knights increased their unbeaten streak to start the season to 3–0, an NHL record for an expansion team. The Golden Knights are the first team in NHL history to have started their inaugural season winning eight of their first nine games. During their tenth game, goaltender Oscar Dansk was injured becoming the third Golden Knights' goaltender to be injured during the season after losing starters Fleury and the recently acquired Malcolm Subban, forcing the team to start a fourth goaltender in 11 games with Maxime Lagace. Fifteen games into the season, Vadim Shipachyov became the first player to retire from the NHL as a Golden Knight when he decided to return to the Kontinental Hockey League. In December, the Golden Knights set another NHL expansion team record of six straight wins, a record they had previously missed when they lost their tenth game of the season, and established a new NHL record with eight straight wins. On February 1, 2018, the Golden Knights set the expansion team record for wins in a debut season with 34 wins after only 50 games, and then on February 21, 2018, set a record for most points by an expansion team in the inaugural season with 84. Clinching a berth for the 2018 playoffs on March 26, the Golden Knights became the first team since the Edmonton Oilers and Hartford Whalers in the 1979–80 season to make the playoffs in their inaugural season in the league. On March 31, the Knights clinched the Pacific Division title, becoming the first true expansion team in the four major sports to win its division in its inaugural season (not counting all-expansion divisions, as was the case in the 1967–68 season). They had led the Pacific since December 23. On April 11, the franchise won its first playoff game in a 1–0 victory over the Los Angeles Kings in the first game of the series. Six days later on April 17, the franchise earned their first playoff series win against the Kings, winning the fourth game by a 1–0 score, which also became their first playoff series sweep. The Knights became the first team in NHL history to sweep their first playoff series in their inaugural season. On May 6, 2018, the Golden Knights defeated the San Jose Sharks four-games-to-two, becoming the third team in NHL history to win multiple playoff series in their inaugural season, and advanced to the Western Conference Finals. On May 20, Vegas defeated the Winnipeg Jets to win the Western Conference Finals in five games, becoming the third NHL team to advance to the Stanley Cup Finals in its inaugural season, after the Toronto Arenas in 1918 and the St. Louis Blues in 1968. The Golden Knights would lose the Stanley Cup Finals to the Washington Capitals in five games. The team's primary logo is a barbute helmet, superimposed on a black and gold seal, with a V-shaped opening. The secondary logo is two crossing swords behind a red star, designed to resemble the star found on the landmark Welcome to Fabulous Las Vegas sign. The team's primary color is steel gray, which is said to represent "strength and durability". The other team colors are gold, red (found in the Las Vegas skyline and at Red Rock Canyon), and black (for "power and intensity"). The first uniforms in Golden Knights team history were unveiled publicly on June 20, 2017. The team's name includes "Knights" as a homage to the Black Knights of the United States Military Academy, Foley's alma mater, and because knights were, according to Foley, "the epitome of the warrior class". Foley had hoped to name his team the Black Knights, but dropped that plan after encountering resistance from federal officials. Foley was unable to call the team the "Vegas Knights" due to the London Knights owning the "Knights" name in Canada. "Golden" was included in the name because gold is, as Foley stated, the "No. 1 precious metal", and because Nevada is the largest gold-producing state in the country. "Las" was omitted from the team's name because, according to Foley, residents tend to refer to the city simply as "Vegas", and because a four-word name would have been too long. The United States Army opposed the team's trademark registration because their exhibition parachute team uses the same nickname; they dropped their opposition after negotiating a trademark coexistence agreement with the team. An objection was also raised by the College of Saint Rose because its sports teams use the same name; the Vegas team's initial trademark application was denied as a result, but was later approved on appeal. The team did clear the name with Clarkson University, which also uses the name Golden Knights. The team's mascot is a Gila monster named Chance. 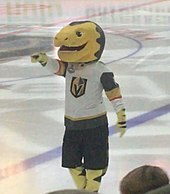 The Golden Knights' mascot is a Gila monster named Chance. He was unveiled at the team's second home game on October 13, 2017. The team opted against using a knight for a mascot because it found that knight mascots used by other teams were not very child-friendly. AT&T SportsNet Rocky Mountain is the regional television rightsholder for all Golden Knights games not broadcast nationally by NBCSN or NBC. The team's designated market includes Nevada, Idaho, Montana, Utah, Wyoming, and parts of Arizona and California. Golden Knights games on AT&T SportsNet are called by former Boston Bruins radio announcer Dave Goucher on play-by-play, and Shane Hnidy, who previously worked color for the Winnipeg Jets on TSN. The team has a three-year radio deal with Lotus Broadcasting. Lotus airs the team's games on its Fox Sports Radio affiliate, KRLV 1340/98.9. KRLV fronts a network of nine stations across Nevada, California, Arizona, and Utah. One game a week is also aired on the company's ESPN Deportes Radio affiliate, KENO 1460, making the team one of only three in the NHL to offer Spanish-language broadcasts. On May 16, 2017, the Golden Knights entered a multi-year affiliation agreement with a minor league team, the Chicago Wolves of the American Hockey League. Like most NHL-AHL affiliation arrangements, the Golden Knights are able to transfer players to and from the Wolves. Although the Wolves are the Golden Knights affiliate, the two teams do not share the same ownership. In addition to the Wolves, the Golden Knights were affiliated with the Quad City Mallards of the ECHL for the 2017–18 season, however, the Mallards ceased operations after the one season. On August 21, 2018, the Golden Knights entered a one-year affiliation agreement with the Fort Wayne Komets of the ECHL for the 2018–19 season. This is a list of the seasons completed by the Golden Knights. For the full season-by-season history, see List of Vegas Golden Knights seasons. The number 58 was retired by the team on March 31, 2018, in honor of the 58 victims killed in the October 2017 Las Vegas shooting. The team is also not able to issue the jersey number 99 to any of its players as it was retired league-wide in honor of Wayne Gretzky at the 2000 NHL All-Star Game. William Karlsson (left) and Jonathan Marchessault (right) are tied as the club's all-time regular season scoring leaders, each recording 134 points as a member of the Golden Knights. ^ "Staff Directory" (PDF). 2017-18 Vegas Golden Knights Media Guide. NHL Enterprises, L.P. November 3, 2017. Retrieved November 8, 2017. ^ Ewing, Mark (July 16, 2017). "Bill Foley And The National Hockey League's Newest Franchise, The Vegas Golden Knights". Forbes. Retrieved July 23, 2017. ^ Mitanis, Marcus (February 19, 2016). "T-Mobile Arena in Las Vegas to Open Spring 2016". Skyrisecities. Retrieved June 25, 2016. ^ "2009 NHL Awards heads to Las Vegas for first time". National Hockey League. March 13, 2009. Retrieved March 14, 2009. ^ "Hollywood aspirations for NHL". The Globe and Mail. Toronto. ^ Brewer, Ray (August 27, 2014). "NHL says no credibility to report of Las Vegas expansion team". Las Vegas Sun. Retrieved August 28, 2014. ^ "NHL denies expansion report, including a second team in Toronto". Toronto Star. August 27, 2014. Retrieved August 28, 2014. ^ "Gallagher: Bettman has changed his tune on NHL expansion". The Province. Retrieved August 28, 2014. ^ Kosman, Josh; Brooks, Larry (November 12, 2014). "NHL picks owners for likely Vegas team". New York Post. Retrieved November 13, 2014. ^ "Maloof family joins effort to land Las Vegas NHL team". Las Vegas Review-Journal. Retrieved November 13, 2014. ^ "NHL gets serious about Las Vegas; can Canadiens redefine themselves?". Sports Illustrated. Retrieved December 10, 2014. ^ "NHL allows Las Vegas to explore expansion interest". The Canadian Press. Retrieved December 10, 2014. ^ a b Snellas, Alan (February 12, 2015). "NHL ticket drive already halfway to goal". Las Vegas Review-Journal. Retrieved July 12, 2015. ^ Snellas, Alan (April 11, 2015). "Businessman behind NHL drive has blue-jeans, relaxed approach". Las Vegas Review-Journal. Retrieved July 12, 2015. ^ McLaren, Ian (August 5, 2015). "Las Vegas group invited to participate in Phase 2 of NHL expansion application process - NHL on The Score - Scores, standings, news, leaders". TheScore.com. Retrieved August 5, 2015. ^ Carp, Steve (June 22, 2016). "Las Vegas awarded NHL expansion team". Las Vegas Review-Journal. Retrieved September 7, 2017. ^ Klein, Cutler (June 22, 2016). "From six teams to 31: History of NHL expansion". National Hockey League. Retrieved January 3, 2018. ^ Heitner, Darren (June 22, 2016). "The NHL Leads the Way in Bringing Pro Sports to Las Vegas". Inc.com. Retrieved June 29, 2016. ^ "McPhee named GM of Las Vegas expansion team". July 13, 2016. Retrieved July 13, 2016. ^ "Golden Knights Sign Reid Duke To Entry-Level Contract". National Hockey League. March 6, 2017. Retrieved May 8, 2018. ^ "Reid Duke becomes Vegas Golden Knights' first signing: Three odd facts to know". CBSSports.com. Retrieved March 6, 2017. ^ "Golden Knights Name Gerard Gallant Head Coach". National Hockey League. April 13, 2017. Retrieved April 13, 2017. ^ a b Carp, Steve (May 16, 2017). "Golden Knights' AHL affiliate to be Chicago Wolves". Las Vegas Review-Journal. Retrieved September 30, 2017. ^ a b Gotz, Ben (June 1, 2017). "Golden Knights form partnership with ECHL's Mallards". Las Vegas Review-Journal. Retrieved September 30, 2017. ^ Shapiro, Sean. "Neal, Fleury help Golden Knights win first game, defeat Stars". National Hockey League. Retrieved October 6, 2017. ^ "Golden Knights opt for #VegasStrong on boards over ads in home opener". National Hockey League. October 10, 2017. Retrieved May 8, 2018. ^ Tucker, Cam (October 9, 2017). "Golden Knights win emotional, historic home opener". NBCSports.com. Retrieved October 9, 2017. ^ "Golden Knights strike balance between respect, celebration in opener". Sportsnet.ca. Retrieved October 11, 2017. ^ "Vegas Golden Knights make history with big win in emotional home opener". USA Today. October 11, 2017. Retrieved October 13, 2017. ^ "Vegas Golden Knights goaltenders just can't stop getting injured". CBS Sports. October 31, 2017. ^ Compton, Brian (October 30, 2017). "Tavares helps Islanders end Golden Knights winning streak". National Hockey League. Retrieved May 8, 2018. ^ "Golden Knights enter the record books again after overtime win". Yahoo Sports. December 29, 2017. ^ "Are the Vegas Golden Knights the best expansion franchise ever?". ESPN. January 5, 2018. ^ "Golden Knights set expansion team record for wins in debut season". ESPN. February 2, 2018. Retrieved February 2, 2018. ^ "Tuch gets tiebreaker in 2nd, Golden Knights beat Flames 7-3". ESPN. February 21, 2018. Retrieved February 22, 2018. ^ Kaplan, Emily (March 27, 2018). "Vegas first to clinch playoff berth in inaugural season since '79-80". ESPN. Retrieved March 27, 2018. ^ Schoen, David (March 31, 2018). "Golden Knights win, 3-2, clinch Pacific Division title". Las Vegas Review-Journal. Retrieved April 5, 2018. ^ Harris, Beth (April 18, 2018). "Golden Knights make history by sweeping Kings". Canadian Broadcasting Corporation. Retrieved April 18, 2018. ^ Dubow, Josh (May 7, 2018). "Vegas Golden Knights cash Round 3 ticket". Toronto Star. Retrieved May 7, 2018. Vegas become just the third team in NHL history to win multiple series in its first season. ^ "Golden Knights advance to Stanley Cup Final, eliminate Jets in Game 5". National Hockey League. May 20, 2018. Retrieved May 28, 2018. ^ "Capitals capture 1st Stanley Cup with 4-3 win over Golden Knights". abc7.com. June 7, 2018. Retrieved June 8, 2018. ^ a b Prewitt, Alex (January 9, 2017). "All In: Behind the scenes with the Golden Knights, Vegas's first major league franchise". Sports Illustrated. Retrieved September 30, 2017. ^ a b c d e Keefer, Case (November 23, 2016). "How Bill Foley and his staff picked Vegas Golden Knights as NHL team name". Las Vegas Sun. Retrieved September 30, 2017. ^ Cotsonika, Nicholas (June 20, 2017). "Golden Knights 'now part of the League' with uniform unveiled". National Hockey League. Retrieved April 18, 2018. ^ a b c Katsilometes, John (November 23, 2016). "Knight moves: Foley picks a precious metal and drops 'Las' in new name". Las Vegas Review-Journal. Retrieved September 30, 2017. ^ Payne, Marissa (December 1, 2016). "Despite U.S. Army's concerns, NHL expansion team's owner sticking by nickname choice". The Washington Post. Retrieved September 30, 2017. ^ Sadler, Emily (August 5, 2016). "Las Vegas' NHL name search complicated by London Knights". Sportsnet.ca. Sportsnet. Retrieved May 8, 2018. ^ Kimelman, Adam (November 22, 2016). "Vegas Golden Knights official team name". National Hockey League. Retrieved May 8, 2018. ^ Brewer, Contessa (January 12, 2018). "US Army files complaint about the colors and team name of NHL's Vegas Golden Knights". CNBC. Retrieved January 13, 2018. ^ Hill, Adam (July 19, 2018). "Golden Knights, Army reach trademark coexistence agreement". Las Vegas Review-Journal. Retrieved July 26, 2018. ^ Carp, Steve (August 9, 2017). "Vegas Golden Knights get approval for name trademark". Las Vegas Review-Journal. Retrieved September 30, 2017. ^ Stevens, Matt (January 12, 2018). "Vegas Golden Knights, Named to Avoid Trademark Dispute, Face Trademark Dispute". The New York Times. ISSN 0362-4331. Retrieved January 24, 2018. ^ "Get To Know Chance, The Golden Knights New Mascot". National Hockey League. October 13, 2017. Retrieved October 26, 2017. ^ "Vegas Golden Knights reveal Chance as team's mascot". Las Vegas Review-Journal. October 13, 2017. Retrieved October 14, 2017. ^ Granger, Jesse (October 20, 2017). "Golden Knights are looking for a standout fan experience at T-Mobile". Las Vegas Sun. Retrieved November 1, 2017. ^ "Golden Knights officially announce TV deal with Root Sports". Las Vegas Review-Journal. Retrieved May 23, 2017. ^ "Root Sports to become official television home of the Vegas Golden Knights" (Press release). AT&T SportsNet. May 23, 2017. Retrieved September 19, 2017. ^ Granger, Jesse (May 22, 2017). "Root Sports to be TV home of Vegas Golden Knights". Las Vegas Sun. Retrieved September 19, 2017. ^ "Golden Knights name first TV, radio broadcasters". Las Vegas Sun. August 15, 2017. Retrieved August 30, 2017. ^ a b "Golden Knights, Lotus Broadcasting happy with partnership". Las Vegas Review-Journal. Retrieved April 19, 2017. ^ "Broadcast Affiliates". National Hockey League. Retrieved May 10, 2018. ^ "By broadcasting select games in Spanish, Golden Knights aim to reach new demographic". Las Vegas Sun. Retrieved April 18, 2017. ^ Metcalf, Bobby (March 13, 2018). "Quad-City Mallards to cease operations at end of season". Quad City Times. Retrieved May 28, 2018. ^ "Fort Wayne Komets Named Golden Knights ECHL Affiliate". National Hockey League. August 21, 2018. Retrieved August 21, 2018. ^ "Vegas Golden Knights Roster". NHL.com. Retrieved October 3, 2017. ^ "Vegas Golden Knights Hockey Transactions". TSN.ca. Retrieved October 3, 2017. ^ "George McPhee named GM of Las Vegas expansion team". The Washington Post. July 13, 2016. Retrieved April 20, 2017. ^ a b Doherty, Kean (May 22, 2018). "How The Vegas Golden Knights Became The Best Story In Hockey". SportsBreak. Retrieved August 25, 2018. ^ Granger, Jesse (March 31, 2018). "Golden Knights retire jersey No. 58 to honor shooting victims". Las Vegas Sun. Retrieved April 1, 2018. ^ "Vegas Golden Knights all-time player list". hockeydb.com. Retrieved May 25, 2018. Wikimedia Commons has media related to Vegas Golden Knights.